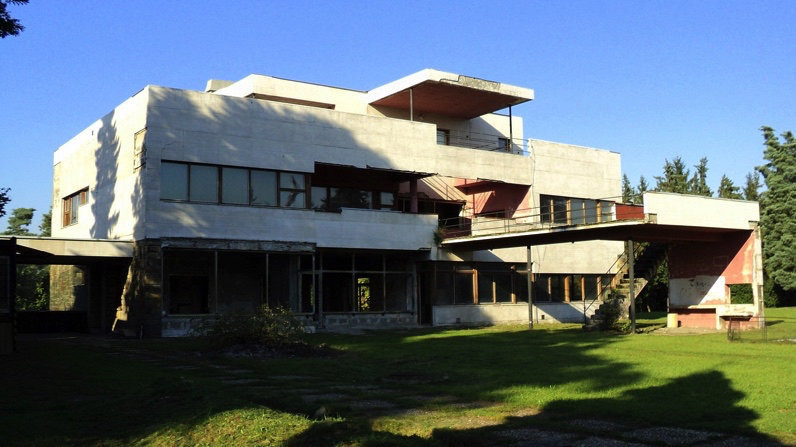 Located a short distance from Prague in Celákovicích is the breathtaking modernist Villa Volman. Between 1938-1939 architects Karel Janu and Jirí Štursa built this iconic Modernist house for Josef Volman. However, for decades during the Communist reign the house, an architectural gem lay neglected and ignored, but now it’s been restored to its full former glory. This is the story of how, why and when. Josef Volman was a visionary, a hugely successful businessman who created Volman Tool Company. He was highly respected as an entrepreneur with a willful philanthropic streak that saw him build family homes for his factory staff, of which there were more than 2500 people. For his own home, which was to become Villa Volman, he instructed the architects Karel Janu and Jirí Štursa to create a unique modernist residence no matter the cost, it is said that he wrote a blank cheque. What he wanted and got was a home perceived at the time to be of equal standing to Villa Tugendhat, a perfect example of Czech Functionalism. Sadly he did not enjoy the beauty of the property as war broke out soon after it’s completion. He died in 1943 having bravely supported the local Czechoslovakian resistance. Whilst the rest of the family remained in the modernist house throughout the war, they came under extreme pressure as the Soviet regime took control and ultimately the Vollman family left the house after the war. In 1948 the factory and family assets were nationalised. Villa Volman was used as a kindergarten and was left to fall apart. After the Velvet Revolution, Villa Volman was returned to a member of the family who in turn offered it to the Czech state. Local company CZ Tech immediately realised the importance of preserving the villa and in 1998 charged Studio TaK to renovate it, headed by architect Marek Tichy. The project was completed between 2012-2015 and the results are breathtaking, the dream of Josef Volman have come to life again. According to the Czech Academy of Sciences, Villa Volman ‘represents the last phase of Czech Functionalism influenced by debates about the relationship between architecture and surrealism held by members of the leftish avant-garde’.